Good morning ... Could Tennessee be among the next red states in line to expand Medicaid? "At some point in time, I think those states that haven't (expanded) will look around and say, we're all 50 states paying for it and 40 states are getting the benefit," outgoing Gov. Bill Haslam said in an interview with The Tennesseean. Several pharmaceutical companies have said they'll delay some of their price increases, under pressure from the Trump administration. But hospitals have made no such concessions, even though they make up a much larger share of health care spending. The big picture: Axios' Bob Herman reached out to 27 (!) hospital systems, many of which have some of the highest prices in the country. None said they would voluntarily freeze or lower their prices. Between the lines: Most of pharma's voluntary steps aren't very consequential. Some have merely delayed price increases; others have lowered prices for drugs that were already facing competition from generics. But President Trump's ability to publicly pressure drugmakers into even those steps is still noteworthy, at least as a sign that these companies fear his Twitter megaphone. Yes, but: Although drug pricing is the political controversy of the moment, hospitals cost the health care system far more. Retail drug spending represents 10% of U.S. health care spending, while hospital and doctor services consume about half of spending. What they're saying: Not much. HCA Healthcare and Sutter Health both told Bob their price growth has been low — less than 3% per year. Northwell Health said it, like most other systems, has "extremely narrow margins ... unlike pharmaceutical companies." The other 24 either declined to comment or did not respond after multiple requests. The Centers for Medicare & Medicaid Services is trying to reinstate the Affordable Care Act’s risk adjustment program, which it recently froze in the wake of a court ruling. Risk adjustment transfers money among insurance companies — the government doesn’t pay. The dispute is over the way CMS calculates insurers’ obligations under the program. Driving the news: Late yesterday, CMS reissued its formula for 2017, along with new supporting arguments for that methodology. It’s also asking for comments about how best to calculate the program’s payments this year. That step “will restore operation of the risk adjustment program,” CMS Administrator Seema Verma said in a press release. Clinical trials for Alzheimer's drugs are having a hard time recruiting participants — yet another setback for a field of research that's already enormously difficult. Where it stands: There are more than 200 trials in search of roughly 100,000 participants, Medscape reports, citing federal officials. The New York Times cites experts who put the shortfall closer to 25,000, but that's still a daunting gap to close. Researchers would need to start by contacting more than 37 million patients in the right age range to participate in a trial, the NYT reports. About 10% of those people would make it on to a clinical trial site for screening. Statistically, about 20% of those people would drop out, and then 80% of those who remain would fail the screening. That leaves 25,000 patients. Recruitment is especially difficult for Alzheimer's trials because it can be hard to reach people who have the disease, especially in its early stages, and also because Alzheimer's is often misdiagnosed. Remember HMOs? The health plans everyone hated in the 90s? Well, they're back, Bloomberg reports. How it works: HMOs tried to control health care spending by requiring customers to get a referral from their primary care physician to see a specialist, and using that leverage to push patients toward cheaper treatments. HMOs were unpopular because patients felt the plans limited access to care they needed. In their place rose high-deductible plans, which aim to control costs by making it more expensive to use certain benefits. But now high deductibles are getting unpopular, so the pendulum may swing back to HMOs. New HMOs are trying to differentiate themselves with simpler pricing structures — replacing deductibles with fixed co-pays for office visits, emergency-room admissions and hospital stays. One company, Bind, is also trying out "on-demand insurance." "Coverage for planned procedures such as knee surgery, tonsil removal or bariatric surgery must be purchased before the operation," Bloomberg reports. "That gives Bind a chance to push customers toward a menu of lower-cost alternatives or cheaper providers." 1. The Senate HELP Committee today will consider a bill to ban pharmacy "gag clauses." Those policies, imposed by pharmacy benefit managers, prohibit pharmacists from telling patients when paying cash for a drug would be cheaper than using their insurance. This wouldn't be a particularly big swing at prescription drug prices, but it would be something. Senate Democrats and House Republicans are both eager to show some sort of progress ahead of the midterms. PBMs' leading trade organization has endorsed the bill. 2. The House voted 283–132 yesterday to fully repeal the ACA's tax on medical devices. Previous, non-binding votes to repeal the tax have garnered significant bipartisan support in the Senate, but putting together 60 votes for anything ACA-related remains a hard job, to say the least. Americans see e-cigarettes as better than cigarettes, but still harmful overall, according to a new Gallup survey. 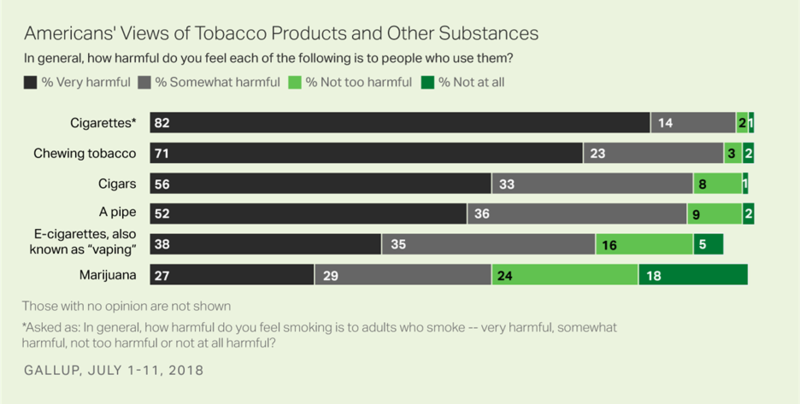 By contrast, 38% said vaping is very harmful, and another 35% said it’s somewhat harmful. Marijuana was seen as the safest of all, with just 27% saying it’s very harmful. The poll was taken July 1-11 of 1,033 adults. Why it matters: The Food and Drug Administration, kind of like the public overall, is still sorting out exactly how it feels about vaping. It has said e-cigarettes have promise as a safer alternative for people who smoke cigarettes, but the FDA has also raised questions about product offerings and marketing practices that appear targeted toward children. What we're watching today: Earnings reports from Anthem this morning and Gilead Sciences this afternoon. Senate health committee considers four health care bills. Energy and Commerce health subcommittee hearing on implementation of the 21st Century Cures Act. What we're watching this week: Energy and Commerce subcommittee hearing Thursday on Medicare's payment systems. More Q2 earnings — follow along with our earnings spreadsheet. Got tips? Let's hear 'em: baker@axios.com.